Dunklau Gardens is designed to provide a comfortable living environment in a caring and compassionate setting, where residents can live life to the fullest while knowing their needs will be accommodated by 24-hour nursing care. The services and offerings at Dunklau Gardens are in place to enhance our resident’s lifestyle. 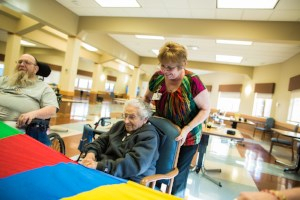 Our devoted staff is available to assist residents in achieving maximum independence and improved quality of life. Our patients and residents can expect innovative care that is customized to meet individual needs, hobbies and interests. The Fremont Health Foundation manages a fund to support the enhancement and activities of Dunklau Gardens. Donations to this fund help us continue to offer our residents, short term rehabilitation patients, and guests an extraordinary environment to live, visit and heal. Dunklau Gardens is home to the A.J. Merrick Short Term Rehab. This beautiful and state-of-the-art unit is named in memory of Dr. A.J. Merrick, a long time physician in Fremont and supporter of the Fremont Health Foundation.